Yesterday, my mother-in-law and I are in a baby supplies store stocking up on essentials and spending way too much on an adorable new wardrobe for the adorable new baby. While we’re in line, I can hear a young woman losing her mind over Theo, whispering to her friend how OMG SO CUTE he is. She approaches. His fingers may be tiny, they are quite long and both grandparents are confident that Theo has a bright future as a world-renowned pianist. A peek into our hospital space. Curtained-off section of a shared room. A little cramped but fine. The NHS is big on sending mom and baby home quickly after birth. Same day is standard, but we ended up spending almost two full days and a night. Theo was a little “jittery” (their word) immediately after delivery, so they wanted to do blood sugar testing, tied to his feedings. That was most of Day 1. A top-to-toe check was the final obstacle, but we were unable to schedule it till next day. 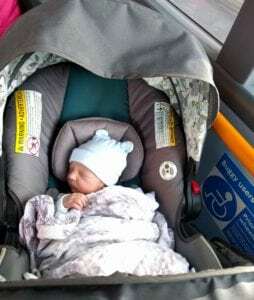 During that, they found a small irregularity in his skull and two more levels of doctors checked it out, but late afternoon, we were finally deemed fit to head home. Matt’s parents had arrived the morning of our Day 2 in hospital, just missing their goal of bring here to care for Dex while I delivered. (Don’t worry, full birth story is coming. It’s a doozy.) Still, it was great that Matt was able to leave Dexter with them and finish out all the hospital stuff with Theo and me, and we all came home together. Because I am apparently unable to give birth or recover from birth without contracting some sort of unpleasant infection, I’ve been knocked out for a few days with a uterine infection. Sore, tender and tired, plus the normal round-the-clock feeding tired, so we’re extra grateful for the extra help. I’m still not 100% but today, I’m starting to feel human again. I’ve had two midwife house visits so far. The first was questions for me and a close look at Theo, the day after we came home. The second was on Monday, day 5, when she diagnosed my infection. More interesting, she brought a scale to weigh Theo, upon which she gently placed him while warning me that it’s not unusual for babies to lose some weight in the first few days, before they start gaining again, especially breastfed babies. 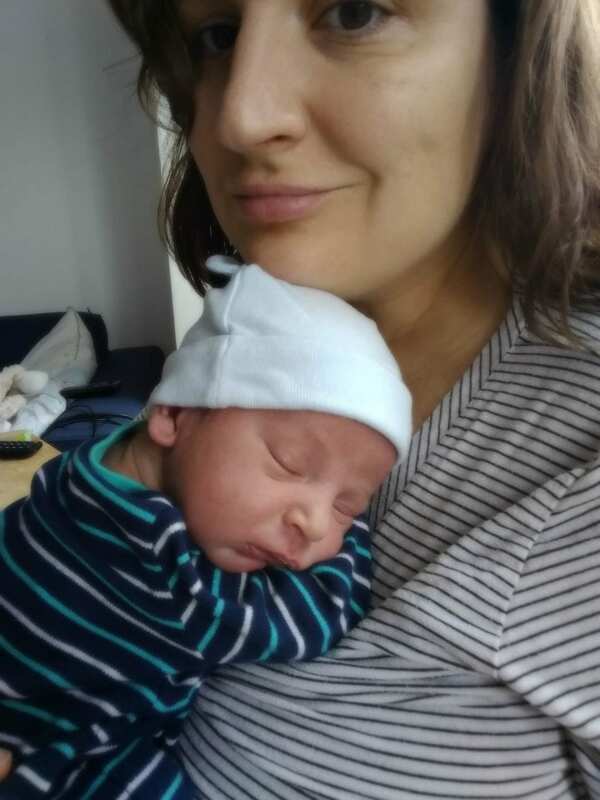 I had a hunch, though, that nursing was going especially well – he latches like a champ, eats a lot, and we really seem to be in sync. My hunch was correct, Theo gained and weighed in at 7 pounds 1 ounce, and this is where all the people who have never breastfed glaze over but the breastfeeding moms are mentally giving me a high five. I can see it, too – his cheeks are fuller, his color is good. Legs still skinny, though. Grandma says he’s fattening from the top down, so it’ll take a bit for the effect to work its way to his lower half. My pal Gemma says everyone in my family always smells like cake, Theo included. I also noticed that he smelled great immediately after he was born, and therefore determined that that means my insides smell spectacular. We haven’t bathed him yet, it’s been a week, and his head still smells like cake and magic. Babies are so cool. It feels… intellectually lazy? unhealthy? unwise? I’m not sure which, to compare Theo to Dex, because all babies are different. I know this, but Dexter is the only frame of reference I have and so compare I do. So far, they’re actually pretty similar. Both good eaters, but I’m more confident when it comes to breastfeeding this time around, so it’s going much more smoothly. Both big sleepers – if T follows in D’s footsteps, this will change before long, but right now, it’s a lot of napping. Both require being woken at night, so as not to miss essential overnight feedings. Neither fusses very much at this phase but both hate diaper changes – Theo especially hates having his package wiped (cold! ), but Dex just hated the whole process. If the pattern continues, Theo will hate his first bath, as did his brother. The parallels are comforting, in a way, as they make this heady newborn phase feel familiar and warm. Like falling back into a sleepy, nuzzly, cake-scented rhythm. I know, however, that before long, Theo will develop and diverge and surprise us with the separate, special person he becomes. I just figured you’d want a look at these dudes, too. Glad you’re all doing well (aside from your infection). Give our love to everyone & big kisses to the babies. 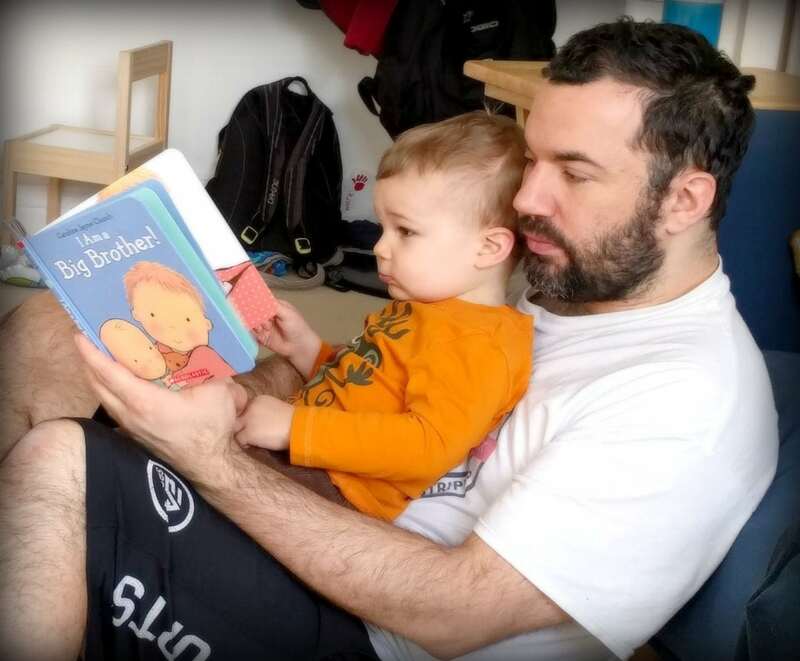 (Matt looks entriqued with the story line of that book 😃). Thanks! I’ll pass on the good wishes.